Berlin, February 1: Germany, France and the UK have set up a payment channel with Iran called INSTEX, to help continue trade and circumvent US sanctions. Brussels hopes the long-awaited special payment system will help save the Iran nuclear deal by allowing Tehran to keep trading with EU companies despite Washington reimposing sanctions after US President Donald Trump abruptly quit the accord last year. 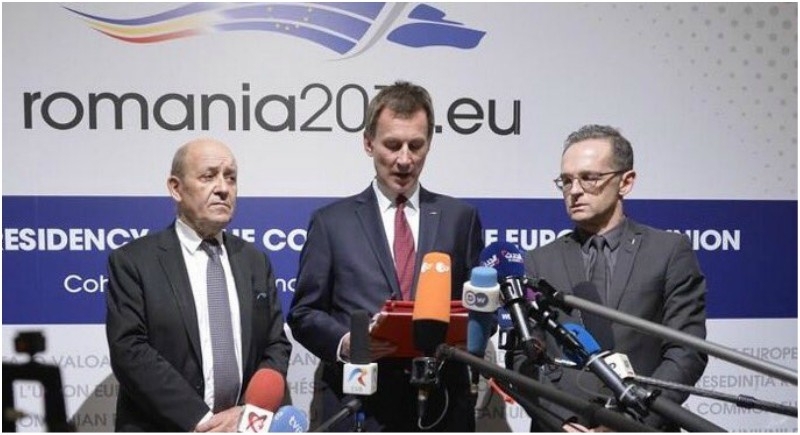 The three countries have launched the device at a meeting of EU foreign ministers in Bucharest. While, the new institution, called INSTEX is a project of the three governments, it will receive the formal endorsement of all 28 EU members. Iranian Foreign Minister Mohammad Javad Zarif welcomed the move. Deputy foreign minister Abbas Araghchi also welcomed the step as a first step by the EU in fulfilling its commitments toward Iran.